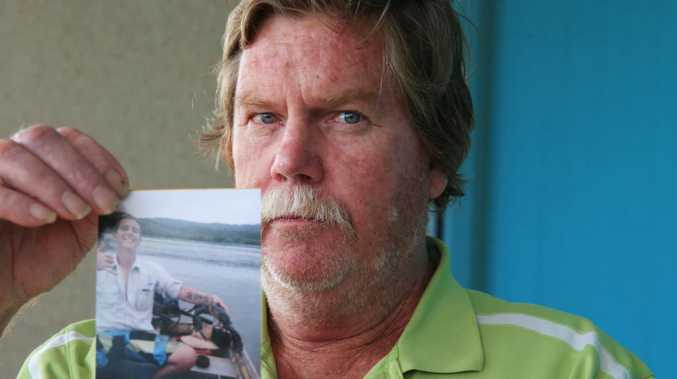 THE distraught father of a missing Tablelands man who has been missing for just over a month has begged for help to bring his son home. Reece Kearney, 26, was reported missing on December 15 after failing to return to his family's Julatten property. He was spotted on CCTV at a Ravenshoe roadhouse later that day and he was also seen in Mt Surprise. His father Ron said they now believe he may have been involved in a crash on this black 2012 Bonneyville Triumph motorcycle and could have been trying to reach Normanton where his brother lives. The family went to the lengths of hiring a helicopter to search the road between Georgetown and Croydon on Saturday. Police are also conducting their own searches. "We love him very much and just (want him to - make contact with family or a friend just to let us know that he's safe and well," Mr Kearney said. "I'm a bit fearful but we've got to hold hope up there that he's out there. "It's been very hard. It's the not knowing, no closure that's the hardest part, but all the family is trying to reach out to him. "He's a good lad, loves his fishing, he's well liked in the community. "He has his issues ... but he's a good boy." He called on grey nomads or truck drivers who travelled the Gulf Developmental Rd to keep an eye out and contact police with information. Reece is described as being of caucasian appearance, about 180cm tall, brown hair and a slim build. He has a distinctive tattoo on the inside of his right arm that has the words, "Life Goes On".